An extensive site occupied during the first half of the fourth millennium, between 4000 and 3500BC, the habitat dating back to the Chasséen period of Champ Madame in Beaumont includes several hamlets: Artière-Ronzière, consisting of twelve buildings partially enclosed by a wall, a funeral complex and several specialized spaces. Le Colombier and Les Foisses, two occupations formed by several activity areas dedicated to domestic occupations and crafts. A building and a cabin located at the Foisses also induce the presence of a hamlet. Building 3 at Artière-Ronzière, which stands out for its architecture and for the ceramic and carved lithic artifacts uncovered in its foundations, seems to be part of the cultural sphere of the southern Chasséen culture. Forming a circle, the funeral complex has five sepulchral graves and a small megalith. Thirteen individuals are buried there, either individually or simultaneously. More broadly, the analysis of architecture and artifacts, fairly homogeneous from a chronocultural and technical point of view, allows to identify cultural borrowing and influxes from other cultural groups that act on the foundation that is strongly anchored in the Néolithique moyen I of Basse-Auvergne. It also identifies the early signs of cultural and social changes that announce the dawn of the third millennium BC. Sylvie Saintot, operations and research manager at Inrap, is a Neolithic specialist in the Auvergne-Rhône-Alpes region. For the past twenty years, her research has focused on habitats and lithic carving industries. 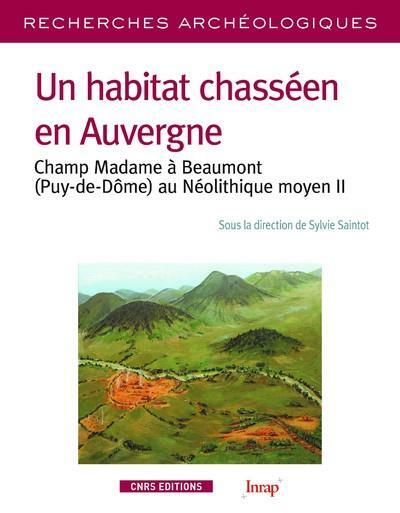 Authors: Christèle Ballut, Laurent Bouby, Vérane Brisotto, Manon Cabanis, Pierre Caillat, Caroline Colas, Fabien Convertini, Catherine Georjon, Christian Le Barrier, François-Xavier Le Bourdonnec, Gérard Poupeau (†), Jérôme Rouquet, Sylvie Saintot, Ingrid Sénépart, Frédéric Surmely, Julia Wattez.